If you’ve been following along the past few weeks, you’ll know that our 2013 SLP development Camaro was recently equipped with a new crate engine from Chevrolet Performance: the LSX376-B15. Immediately following the install, our team added the tried and true SLP 2300 TVS supercharger in an effort to test the boundaries and see what our supercharger could really accomplish on a strong, unmodified base like the B15. 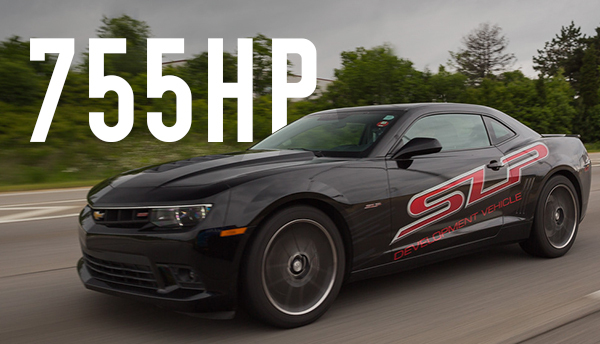 This week, we finished our testing and came to the final conclusion that the combination is capable of making 755 horsepower at the flywheel – assuming a 15% loss, that’s 642 horsepower at the rear wheels. In regards to torque numbers, we were able to unleash 623 lb-ft at the rear wheels, and 732 lb-ft at the crank. These numbers were accomplished utilizing a 2.8-inch pulley and 93 octane pump gas at 14.5psi of boost. Our SLP Camaro is also equipped with SLP long tube headers and a LoudMouth III exhaust system.